Great…just when I have talked myself out of wanting to do Aconcagua! Beautiful, crisp shot. A day when you see no one in the middle of nowhere is a successful day in my opinion. Nice shot. 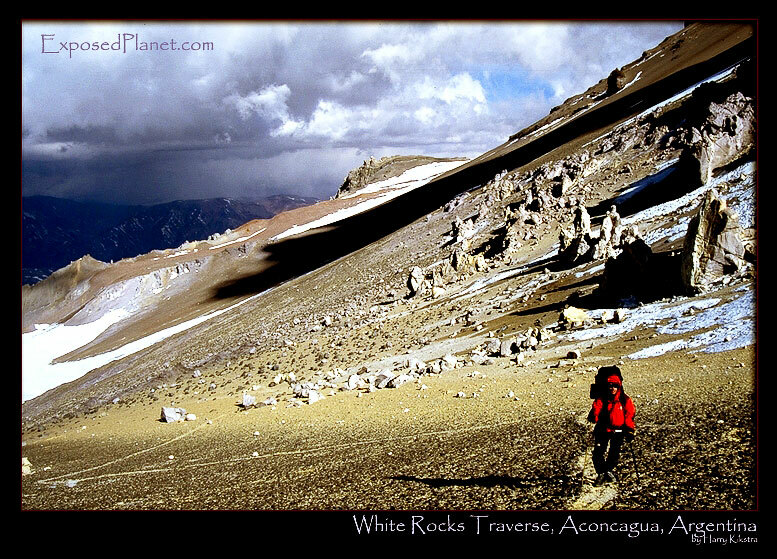 The story behind "White Rocks traverse on Aconcagua, Argentina"
Shot exactly 6 years ago today, a day before our summitday on New Year’s Eve. As Erik and I decided to go down the other side of the mountain we had to carry all our gear, trash and food over as well. This means shuttling of loads across this gentle slope from the regular high camp to the White Rocks camp at 6000m altitude. We saw nobody else that day, which changed the following day when we climbed on to the highest point outside of Asia.